This is part 3 of our dog lover puzzle series! The last puzzle we created was the dog lover crossword puzzle. You can view the completed dog lover crossword puzzle with all of the answers below. Next up is our dog lover picture search puzzle. This puzzle is really fun because it blends the love of summer time with the love of dogs. Plus the picture search is completely made up of emojis! How fun! 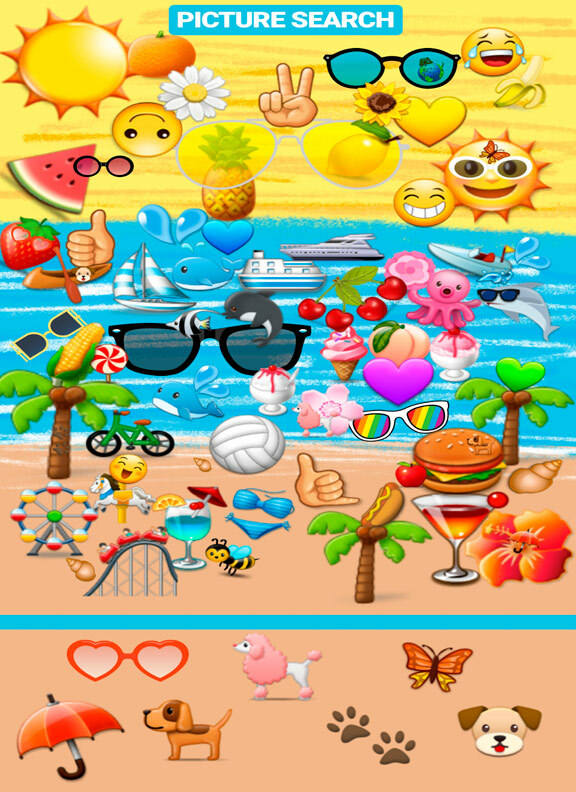 This beach themed picture search has a handful of hidden emojis amongst all the other summer time emojis. The hidden emojis that you must find are shown below the blue line. Find all 7 hidden emojis, which are hidden above the blue line. Circle each emoji as you find them! Make it even more fun, print two or more copies and go head to head against a friend or family member! First one completed wins. You could also do a “time attack”. The way it works is each challenger tries to complete the picture search with a timer running. When you have completed the puzzle stop the timer. Then have the next challenger do the same. You can have as many challengers as you’d like, lowest time wins! Be sure to click the image below, then print! If needed you can adjust the “paper size” and “scale” print settings to fit the image to the type of paper you wish to print on. Check back soon! We will post the solution to our picture search puzzle.